In the cleft of a rock, on the crest of a hill, grows a tree that belongs to no-one and to everyone. When a little baby girl is found swinging in the branches of the tree, the villagers name her Tiranamba Adesimbo Mbobo and love her as if she were their own. But Tiranamba never speaks a word. 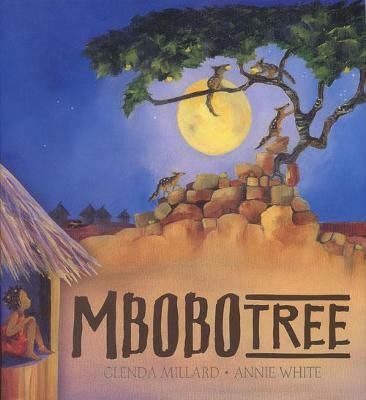 When the life-giving tree is threatened, Tiranamba finds her voice, and her bravery saves the village. A stunningly well-told story.. An excellent book with brilliant illustrations that would make a really worthwhile contribution to the RE unit on the symbol on trees. Annie White's childhood was spent jumping waves on the beaches along the Great Ocean Road, climbing very tall trees and drawing endlessly at the kitchen table. Today, Annie has graduated from the kitchen table to a wonderful big work room, full of light and overlooking a giant liquidamber tree. She has illustrated over fifty books for children and lives in Melbourne. Award-winning author Glenda Millard grew up in a house with no television. Her mother read fairy tales, fables and parables to Glenda and her sister while her father worked the night shift in a factory. When she became an adult, Glenda wanted to write myths and legends of her own. Mbobo Tree is one of them. She lives in Victoria, Australia.